Linear ramp rates, high volume and air velocity are critical to effective testing. Our model 8420 Strife Testing System may be your most cost-effective solution for detecting and eliminating latent defects saving you and your customer time, and saving you huge sums. 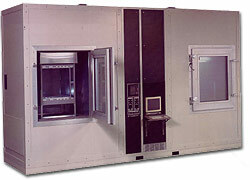 Our Systems are designed to meet your requirements for quick and efficient and reliable stress testing. Our unique high volume airflow design guarantees optimum thermal stress at high and low temperatures. Cooling and heating ramp rates can be clearly configured to allow maximum stress for even hard to test devices. Modulating refrigeration valve with time proportioning solid-state relays utilizing state of the art programmable microprocessor controls to produce optimum temperature equilibrium at any point in the specified temperature range. 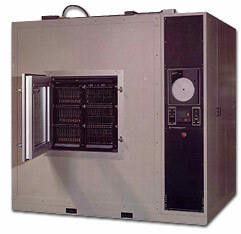 Programmable Controller with RS 442/485 Communications. 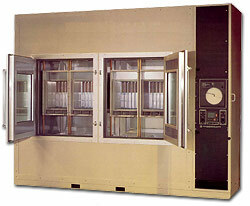 Mechanical Refrigeration Section: Remote Location Optional. 200 Amp/460 V Electrical Enclosure. Cardguides are adjustable to any size P.C.B.’s or Module. 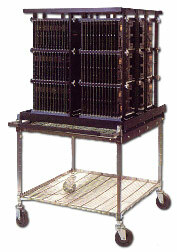 Maximum capacity of 416 – 6” x 8” boards (or equivalent) on 1” centers. Fixtures are loaded into the chambers from a fixture transporter. Air cooled condenser, evaporative condenser, plant chilled water or cooling tower.